Shame we can't get High Gas Prices and Low Ethanol prices at the same time..
Just wait for gasoline demand to increase as a result of the lower prices, and for ISIL to take over Baghdad or key oil facilities. Why do E85 prices move in lock-step with gasoline prices at all?!! Paid $2.20 for E85 yesterday and 10 miles away- Kwik Trip was $2.89 Shame! Sounds like around here, the Speedways are in the low $2/gal range while the Thorntons and Woodmans are around $2.59-$2.69/gal, but there is one BP that's closer to home than any of them that recently dropped their E85 price to $2.99/gal........ That station and a near by Shell tend to be the worst on all fuels though, those same Speedways are in the low $3/gal for regular with the Thorntons and Woodmans being close in price, most stations near home and work are right around $3.20/gal, but both those stations were about $3.46/gal for regular when I came home from work last night. 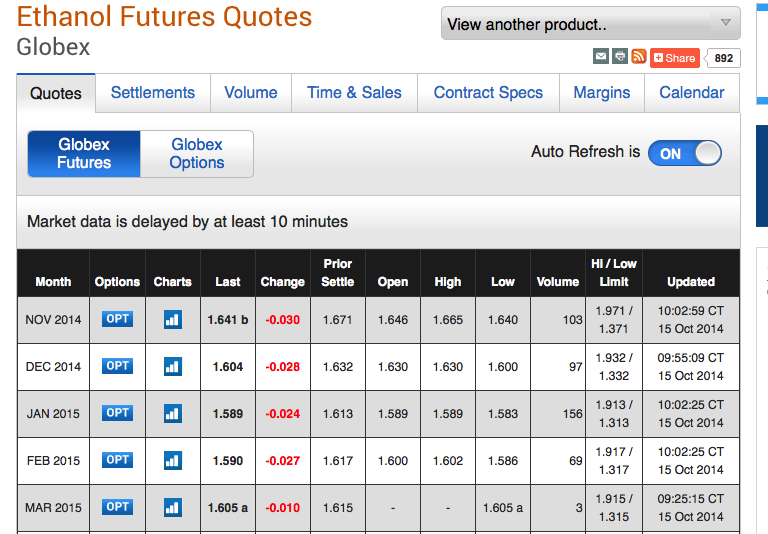 As of this morning, Ethanol Futures in Chicago have dropped to $1.50 a gallon. RIN's last traded at .47 cents- down from 70 cents last week on the news of the lower Renewable Fuel Standard requirements from EPA published on Friday. Better fill up the tank today, while you can, as it is possible the price of E85 at the pump may be creeping up this week as a result of the RIN's fall.